The goal of a presentation is always the same -- to engage the audience, to move them. This rule of thumb holds true regardless of the stage. It’s so in the courtroom, on the floor of the U.S. Congress, in the boardroom, and in the classroom. Litigators engage a jury to win their case for their client; professors engage their students so that they can best teach the subject matter. Engagement leads to better understanding, which then leads to better retention and enhanced persuasiveness. Retention and understanding are the keys to success. As a student of presentation technique, I was especially lucky over the last summer to have two terrific sources of experiential information on the subject and a good deal of insight in to what works and what does not. My sources were Ms. Shawn Estrada and Ms. Jessica Dunaye, two of our summer interns at A2L, who have some pretty specific thoughts about presentation style after having sat through over 2,000 lectures from many, many professors and students throughout their college careers. After having spent a summer with A2L, learning first-hand how great litigators operate and now they are counseled themselves by litigation and jury consultants, they strongly believe that the litigation presentation techniques espoused by the A2L team are relevant in many aspects of life. Here are some of the interesting tidbits from these two. They had so much to offer, I’ve divided their points into a series of articles. Don’t use PowerPoint as a crutch. PowerPoint is a great presentation tool and the standard foundation for most courtroom, business, and classroom presentations. It enhances a presenter’s points when used correctly. However, it can also ruin a presentation and make its user a tremendous bore. It is easy to feel prepared after pasting a few words on a slide and/or committing your entire presentation outline to a series of slides, but we all know the result: the unprepared presenter; and its consequence; overwhelming the audience with a wall of text. It’s painful to watch such a presenter grappling with the technology, fumbling with their notes, and stuttering through their content. It doesn’t go unnoticed when a presenter seems to be hiding a lack of knowledge, a lack of mastery of the subject matter, or a failure to practice a presentation behind a PowerPoint slide filled with text, reading it word for word. During a presentation, it is important to convey your position as an authority on your subject matter, which is why it is crucial to prepare yourself thoroughly. The best ways to ensure that you are not using your PowerPoint as a crutch are to make sure that you know your presentation perfectly and to make sure that you are using graphics to supplement, not to direct your presentation. You should NOT be relying on the content of your slides to drive your presentation. This is true for professors teaching a classroom of students and for students presenting as part of their coursework. Student presentations are a college classroom staple. Every semester it’s déjà vu: a nervous, obviously unprepared, student slowly walks to the podium at the front of the class to take his or her turn presenting something to the class. Usually their goal is to teach the class that day, and professors expect nothing but the best. It’s a reasonable expectation, too, as the subjects are straightforward and presenting is simply an exercise in corralling the facts into a neat package. The biggest give-away that a presenter does not know what they are talking about and is uncomfortable making the presentation is reading directly from the PowerPoint slide. Not only does this almost instantly disengage the audience; it also shows a lack of command of the subject (this also goes for burying your head in note cards). Also, a presenter needs to know his subject and presentation well enough to that he can dodge some curveballs. Some students will go to great lengths to “participate” in your discussion because they know it’s an easy grade booster. This sometimes means asking random questions just to show the professor they are trying to engage in the topic of the day. For an unprepared presenter, these students are their worst nightmare. Being prepared means researching your topic fully and practicing until you know your presentation by heart. We can all plan to keep from using PowerPoint as a crutch. 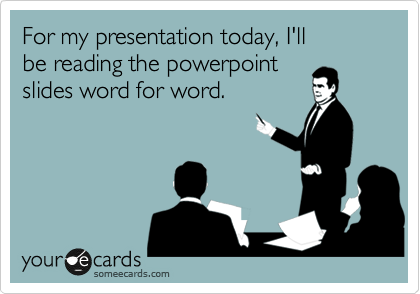 In fact, at A2L we have many tips on how to make PowerPoint your very best friend. The combination of a well-prepared presenter and a carefully-designed graphic is sure to be a recipe for success for any student or litigator alike.